or tacky, but gives that soft recoil absorbing feel, without effecting accuracy. or deteriorate and is resistant to all solvents and oils used around firearms. Hogue to produce superior rubber grips with features that out perform all other makes. 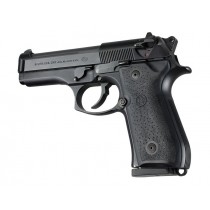 Fits: Beretta 92F, 92FS, 92SB, 96 and M-9. (Panel Style).